Mentioning that Anton Kabanen is the former songwriter and guitarist for BATTLEBEAST, is about all I’m going to say about that (former) relationship. I’m sure there are plenty of interviews and articles on the google machine that can provide you with more information about whatever went down between them. I want this review to focuses only on Anton’s forward direction, BEAST IN BLACK. It is such a great release that he, and the rest of the band, deserve nothing less than my, and your own, focus. 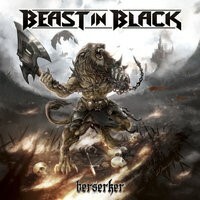 BEAST IN BLACK’S debut album “Berserker,” has a very obvious power metal sound to it. This is a good thing, of course, but it also wouldn’t be fair to say that’s all it brings to the table. Within the ten tracks, your ears will hear a fine tuned band that also adds in classic metal elements and even some non-metal sounds; they play their music with such fervor and conviction that everything thrown into your ears is going to have honest, raw, emotional power to it. Yannis Popadopoulos was the right person to front this band—his expressive vocals are exciting and contain some of the best range I’ve heard in some time. On the opening track, “Beast In Black,” he begins with a snarl like he wants to rip your head off. Second later, he has a falsetto classic Power Metal yell. In essence, he reminds me of a more deadly Ripper Owens. On the second track, he sounds just like a woman. This isn’t a knock against him, whatsoever. To exhibit such a voice, to change his own to become so lithe, gentle, and soaring shows a control that most vocalist can only dream of. During the opening of “Blood of a Lion,” he uses a similar vocal style but adds a raspy, almost hoarse layer to it, becoming a Heavy Metal Rod Stewart. The unique approach the vocals take is matched by the equally diverse and outside the box thinking of the music itself. The most glaring example of this is the seventh track, “Crazy, Mad, Insane,” which combines robot vocals and dance club synths. These sounds really should not work with metal but you know what? BEAST IN BLACK doesn’t care and they make it work in spades. Tracks like “Born Again,” and the aforementioned “Blind and Frozen,” likewise feature similar style synths and a bouncy, trance like sound. Luckily the keyboards also as varied as they don’t rely just on those dance rhythms. “Eternal Fire,” and “End Of The World,” display keys straight from the 80’s and would make EUROPE proud. But what of the “meat and potatoes,” of the music? The guitar, bass and drums? I’m happy to report that backing up the epic vocals and keys are one hell of a rhythm section played by a definitely competent metal band. The guitar riffs uses steady gallops, and traditional classic metal riffs than they do speed like some other Power Metal bands. It works better this way as Anton and Kasperio Heikkinen are able to play full force while also keeping the songs grounded firmly into “pulverize your face,” area. Both “Zodd The Immortal” and “The Fifth Angel,” rock as heavy as anything released this year and sounds like JUDAS PRIEST on steroids. To his credit, and amazing song writing skills, Anton knows when to break down the walls and when to hang back a bit, to allow the other elements/instruments to shine. All too often bands with “one main guy” tend to be nothing more than musical masturbation and too much show off time for one guy but Anton brings the band together as a team. Together this team, this band called BEAST IN BLACK have crafted one of the best albums I have heard this year. Power/Classic Heavy Metal bliss. If you like this style at all, then you need this in your collection.